Artie flips out, recognizing the cyborg from the night before and earlier incidents around town where Rom apparently vaporized people in cold blood. Steve tells Artie the the truth, knocking through the disbelief when he reveals the dead body of one of the Hellhounds on a table in the corner. Artie is still uncertain but reluctantly agrees to help when Steve calls Brandy at work with a plan. The two men barely manage to drag Rom into the back of Artie’s squad car, then take off just as three more Hellhounds arrive on the scene in dog form. They find the bodies of their fallen brothers and start howling before they’re silenced by a Wraith agent. He orders them to shift into phantom form (the purple pajamas) and take off with the bodies, Rom’s Neutralizer (still encased in a force field of dark magic), and any other evidence that could tie them to events. At Safeguard, Dr. Sweet meets with one of the Wraith leaders, a shadowy figure manipulating a black crystal ball. With Rom injured and his Neutralizer in Wraith possession, Sweet feels the time is right for a coordinated attack on the Spaceknight, but the figure instead decides to summon Thornoids. Sweet is terrified since Thornoids are mindlessly violent beasts that can’t be controlled, but the figure believes Clairton is isolated enough that the devastation won’t spread and that Rom would likely be blamed by the people for any repercussions. As he initiates the spell, a rain storm spreads over Clairton, with tiny seeds coming down among the drops. When they reach the ground, they begin to grow into thorny, purple vines. 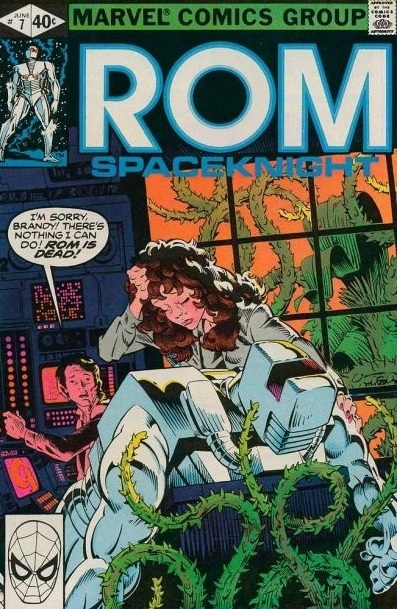 Rom and Artie sneak Rom’s body in the lab where Brandy works as an administrator, and try out any test they can think of to see if the Spaceknight is even still alive in that armor. They think they detect brainwave activity and Steve, the mechanic, sets about trying to find a way to kickstart Rom back into action. He settles on trying to syphon off the excess energy in Rom’s circuits, but even that doesn’t seem to work, and Brandy throws a fit when Steve can’t think of something more to do. Thornoids suddenly force their way into the room through the windows, growing and spreading throughout the lab. The humans try to fight the plants off – Steve with a chair, Artie with his gun, Brandy with a beaker of sulphuric acid – but Steve and Brandy are forced into a corner, unable to do anything but watch as the vines wind about and quickly kill Artie. That’s when Rom reawakens and dives into the action, slicing and tearing through the plants with his metal hands. Steve and Brandy pitch in, using CO2 extinguishers to slows the plants down with cold, and the threat is eventually destroyed. Rom thanks Steve for finding a way to reactivate him, while Steve kneels over the mangled body of Artie, suddenly realizing the implications of the war that’s found its way to his back yard. Oh, Artie. It’s a testament to the talent behind this book that they can take a seemingly throw-away one-off character and, over the course of a single issue, make him a key player in events, a wonderful new addition to Rom’s human helpers, and really make you care about the guy…. then pull a total Joss by violently strangling him to death, thorns bloodily digging into his flesh, right before our eyes. This was a dude willing to break protocol so he could fill his friend in on a conspiracy. This was a dude willing to endanger his life and job so he could help his friend transport and revive an alien being. This was a dude willing to believe his friend when Steve told him the truth about Rom’s mission. Artie was one hell of a dude. Sure, he whined and moaned about how crazy everything was and how much trouble he’d get into, but when the cards came down, he never hesitated to grab the cyborg’s legs while wheeling the body out to his squad car or to break into the local lab with the same cyborg splayed on a gurney or to dive in front of his friends and give his life to buy them a few more precious seconds. Artie, you will be missed. This issue is fantastic, even with the eponymous hero of the title spending all but the last two pages in a coma, forcing the humans to make due without him. And they do. There’s great moments of tension, like Steve’s constant struggle to find out why Rom isn’t working and Brandy’s outburst that Steve isn’t succeeding because he’s secretly jealous. There’s great moments of bonding, like all of the Artie/Steve moments and everyone sneaking the massive limp cyborg through the halls of the lab. There’s great moments of humor, like Artie’s bogglement and, hey, have I mentioned Rom’s 8-foot tall, 850 pound frame constantly sprawled over things as the humans are shoving him around everywhere? Hilarious! Brandy’s kinda been pushed to the side a bit these last few episodes, but the creators are making the most of Steve’s time in the spotlight by really developing him into a solid, dependable everyman hurled out of his element. He reacted to it poorly early on, but now that he’s starting to wrap his head around things, he’s starting to become a driving force. Though how exactly did he get Rom off the ground to begin with? The Wraiths hang in the background a bit this time around, the only key scenes being the bit with the Hellhounds where they tidy up a plot thread and remove evidence our heroes can use to further recruit for their cause, and the meeting between Dr. Sweet and the shadowy figure. Much has been made of the fact that Wraiths use a combination of technology and sorcery, but most of what we’ve seen so far has been pretty scifi, with transdimensional generators and laser pistols and what not. With the shadow ninja Hellhounds of the last issue and the mysterious wizard here (a figure previously glimpsed, still shaded, in the flashback of issue #1), the magic is now at play as spells and familiars are cast left and right. There isn’t much personality to the unfortunately named Thornoids, but there doesn’t need to be. They’re a tank, a monster thrown at the heroes for no other purpose than to slow them down. They have no motive, no reason, they’re just born to snag and strangle prey. However, despite being rained on the town, we only ever see them attacking our heroes at the hospital. Are there more about town? Is there a huge panic in the streets outside our immediate field of view? Looking forward to the next issue to find out. So they answered my question about the Neutralizer, which is indeed still encased in a forcefield of energy. It’ll be interesting to see how Rom’s mission and tactics will be affected now that his key weapon has fallen into enemy hands. And will the Wraiths set about reverse-engineering it? Using its transdimensional properties to free their forces from Limbo? Only time will tell. Again, Hellhounds as large, eyeless Pinschers? Awesome. Hellhounds as hunched guys in purple spandex and red hoods? Not so much. I’m surprised we haven’t learned the fate of Archie Stryker yet. Given how adamant Dr. Sweet was about getting rid of him, you think he’d be dead and gone by now. Crows are apparently a favored image of Wraiths who need to travel fast. Second time we’ve seen one take that form. I hate it when a single issue feels the need to break its 20 odd pages into chapters. Jack Kirby did it all the time and we randomly get it here as, following “As I Lay Dying”, we get “Alien Seed!”, then “Greater Love Hath No Man!” It’s one story. There’s no real narrative breaks or individual chapter arcs, so why are they necessary? Was Mantlo unable to pick between three titles just decided to cram them all in there? If so, the first two are fine, but what relevance does “Greater Love Hath No Man” have to thing? Sure, there’s the brief spat between Brandy and Steve about emotions, but it’s a tiny part of the story. Is it about Artie and the end of his brief story? If so, wouldn’t “Greater Friend Hath No Man” be better? The cover for this issue was by Michael Golden, who was doing interiors for The Micronauts with Bill Mantlo at the time. This is a solid issue, perfectly transitioning things from the last episode to the next, and anchoring it with the tragic tale of one Officer Artie Packer. I’m quickly learning not to nitpick plot threads that seem to be dropped or under-developed because everything that seems to be missing is usually picked up on and explored by the next issue, showing that there is a nice elaborate master plan going on instead of things being made up as they go. It’s hard to talk about Rom without occasionally mentioning Micronauts since both debuted the same year and both were written through their entire runs by Bill Mantlo. In fact, I do plan on working my way through Micronauts here as well down the road.